If this way of writing the seven is still used in China, then it is useless as an antique reference. I thought, but I forgot to say it, that the curve is too pronounced, like you said. Shelley, just discovered that the 柒 is still used in China, apparently. I assume it is the same in Hong Kong? Actually, this is the same reason why amounts are written in letters instead of numbers on cheques, in the west. Here its main use is for writing amounts on cheques and bank related documents, to prevent that the simpler numbers can be modified/falsified later. No, I don't think that the character means it is old, as it is still in use. 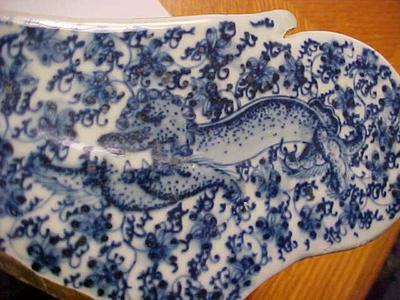 But even if it were, 20th century fakes also imitate old characters, even some that were not used since the Ming dynasty. The bottom and decoration are still unacceptable for a genuine antique, I'm afraid. The bottom color indicates that it was artificially made to look dark. It is mostly this type of brown that is found on fake antiques. And the curving is much too acute to be comfortable for the head when sleeping for a prolonged time. It is just not an ergonomic shape. Usually the curving is much less pronounced with the real antique ones. Unless there is another purpose to it, this shape has no practical use, I would think. 1 Can the word "7" which is no longer used in China today an indication that it is old? 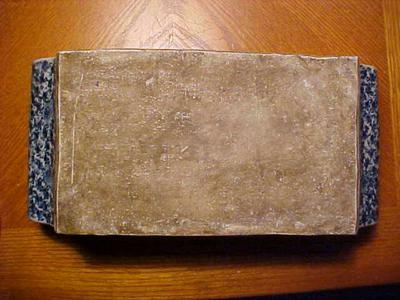 2 May be the pillow was taken to Japan by a Chinese migrant or a Japanese having lived in China a long time ago? Hi Peter, thank you for your expertise, I had my doubts, I've never seen a decoration like this on traditional porcelain, thanks for keeping me inline, from Stan. Don't buy it if you didn't already. There are several points against this being a genuine item, and none for it. 1. There are no pillows with this shape. Porcelain pillows were actually used for sleeping...can you imagine what this rounded surface does to the head? Real sleeping pillows were block shaped, frequently with a slightly slanted top face and/or slightly rounded, but not this way. Frequently the figure of an animal or child was used. 2. The decoration is nothing clearly Chinese or Japanese, i.e. such a decoration did not exist in traditional porcelain. 3. 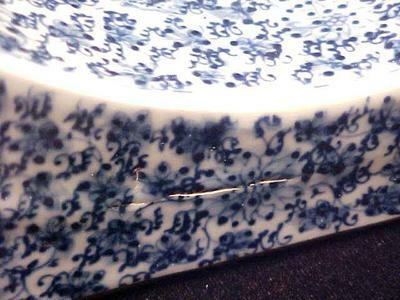 The mark says that it was made in the 7th year of the Qianlong reign by an establishment called Xuhua-tang. The third character from right is 'seven', but this one was never used for 7 in Japan. I've never seen it in all the years in Japan, despite reading Japanese. It is an alternative Chinese character for the number. I first encountered these characters when I came to Taiwan. China won't use them anymore either, I think. They are just a more complex form of the normal numericals. 4. The bottom is too dark and looks odd for a genuine antique. 5. The Japanese never used porcelain pillows, as far as I know. Hi Peter, I am thinking of purchasing this item. 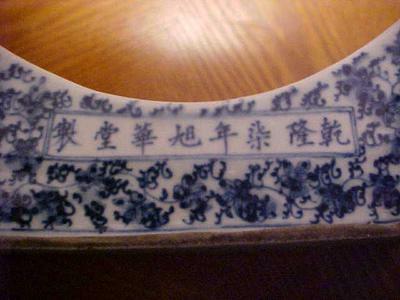 it is a porcelain pillow, I am not sure if it is Chinese or japanese, I was told that the lady he bought it from purchased this in Japan in 1950 and bought it at an second hand store, could you tell me what it says and if you think it is chinese or not, thanks from stan.